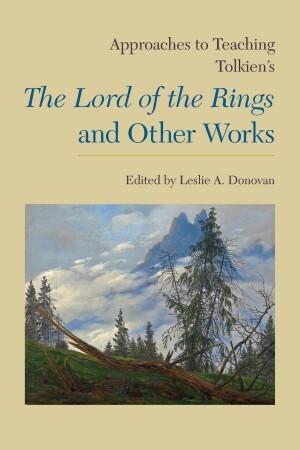 Leslie Donovan discusses her edited volume Approaches to Teaching Tolkien’s The Lord of the Rings and Other Works with James C. Hatch. JH: How did you get interested in Tolkien, and when did you start teaching his works? LD: I first read The Hobbit and The Lord of the Rings when I was in high school, somewhere around 1974 and 1975. A family friend knew that I was a big reader and had read all of C. S. Lewis’s Narnia books. She gave me a copy of Tolkien’s books, and I immediately fell in love with them, especially The Lord of the Rings. But I never thought Tolkien could be a subject for serious academic study until I enrolled in an undergraduate course on Tolkien at the University of New Mexico in 1982. I never intended to be a teacher. But after I completed my PhD in medieval literature, I tried to make ends meet by working as a part-time instructor at a community college and decided to propose a course on Tolkien, because I knew such a course would attract strong enrollment and therefore bring in a paycheck. Over the years I had yearned to teach such a course; my training as a medievalist only deepened my love for Tolkien’s accomplishments. Since my proposal included a healthy dose of medieval literature (Beowulf, Sir Gawain and the Green Knight, The Prose Edda, and selections from Le Morte D’Arthur), it was accepted, and I taught my first Tolkien course in 1995. At the University of New Mexico, where I landed a tenure-track job, I have now taught at least six different variations of the Tolkien course at different levels. JH: Many student readers already know The Lord of the Rings well and have a difficult time seeing the book subjected to the rigors of literary criticism. For many readers, Tolkien’s works are more than literature or fantasy: they are a consolation. How do you teach a book that means so much to so many students personally? LD: It is a delicate task. Yet Tolkien’s works, when we apply literary criticism to them, hold up beautifully. My students consistently have told me how much greater their enjoyment and understanding of his achievements were after studying the books systematically in a college course. For me, it continues to be the very best kind of teaching experience. In no other course I have taught can I expect almost all the students to have done the reading before they step into my classroom on that first day. This means we can begin discussing together meaningful topics and interpretations immediately. That’s an extraordinary experience for a teacher, to feel as much like a colearner as a teacher. Because of the highly personal connection so many of us have to Tolkien’s works, my students and I end up bonding. We argue about the texts as much as we revel in the pleasures we find in them. JH: How has teaching Tolkien changed over the past decade or two, especially since the Peter Jackson movies were released? LD: In some ways, teaching Tolkien has changed substantially over the last twenty years, but in other ways I feel that very little has changed. When I first started teaching his works, the vast majority of students were male. Very few female students enrolled, probably because cultural stereotypes at the time suggested that such books were not intended for them. I remember vividly that the first time I taught Tolkien in an interdisciplinary honors course, out of the eighteen students enrolled, only three were women. I felt out of place. But, as Shelley Rees discusses in her essay in this volume, we women have cared deeply about Tolkien’s works from the very beginning: back then, we were just more reluctant to reveal our interest publicly. In my current Tolkien course for honors, the enrollment has reversed: of my seventeen students, only six are male. One of the other changes in teaching Tolkien is a result of the movies. Most of my students have seen the films before they ever read Tolkien’s text. Whether one admires or despises Peter Jackson’s work, all of us who have seen his films have been influenced by them. No longer can any of us read The Lord of the Rings; (and now also The Hobbit) without having in our minds the faces of the actors. Even though I have read Tolkien’s texts many, many times, I still sometimes have to check to see if I am remembering a scene from the book or from Jackson’s version of it. This can become problematic in a class discussion. I always make a point to emphasize that we are focusing on Tolkien’s actual text in class, and I often pause class discussion to check to make sure some piece of evidence is actually a feature of Tolkien’s (unless we are discussing the films, specifically). We cannot pretend the movies do not exist or ignore them, but I insist that we acknowledge them as separate, though related, works. When I first began teaching Tolkien, we had no need to make such distinctions or take such care to identify and distinguish Tolkien’s intentions and meanings as the original version rather than a recent, modern adaptation. Yet, despite the differences in student populations and despite Jackson’s films, the core of what makes teaching a Tolkien course special for me has not changed much at all. Students who sign up do so because they deeply love the stories. What matters to them is that even the smallest, most insignificant people can be heroes, can save the world. My students want to make their lives matter, to build friendships that change the course of their life, to comprehend the complex moral and ethical choices they must make. Today, in my Tolkien classes, we often talk about how the work echoes our own contemporary fears related to terrorism, but we have always focused on the impact of unexpected alliances, the problems of greed, and the joys of living simply. If we talk more these days about issues of race, gender, and culture, we talk no less about the relation between fate and free will, the nature of power, and the need to respect the natural world. JH: How do you teach some of Tolkien’s ideas—secondary worlds and eucatastrophe, for instance? LD: These are central concepts that I include in all my Tolkien courses. We spend at least a week early in the semester reading and discussing Tolkien’s essay “On Fairy-Stories.” It provides a foundation for later discussions of his fiction. As the course progresses, I ask students to identify moments in their own lives when they have engaged in acts of subcreation, as Tolkien explains it in his essay, or personally experienced eucatastrophe. To illustrate such ideas, we discuss not only Middle-earth and Tolkien’s larger legendarium but also his short works Smith of Wootton Major and “Leaf by Niggle,” both of which provide students with additional models for understanding Tolkien’s ideas of subcreation, eucatastrophe, and mythopoeia. JH: Many readers perceive Tolkien’s text as based on medieval contexts and tropes. In what ways is the content of The Lord of the Rings as much indebted to modern ideas as to medieval ideas? LD: The medieval traditions embedded in Tolkien’s works are what first drew me to them and kept me reading them over and over. The Lord of the Rings, in many ways, offers all the tropes and conventions of medieval literature and culture rolled into one package—the dragons, heroes, elves, hand-to-hand battles with swords to save people and places; horses descended from the gods; and so on. The Middle-earth texts bring together the best aspects of medieval studies, kind of like a Best Hits of the Middle Ages album. Yet, Tolkien’s texts, especially The Lord of the Rings, are modern in many fundamental ways. Even though we have the model of the chivalric hero from the lineage of ancient kings in Aragorn, a type of Arthurian once-and-future king, the real hero of the story is Frodo, an ordinary person, a modern everyman. Perhaps even more heroic is Sam, a simple gardener. In fact, neither Frodo nor Sam alone is in himself a hero, but together they are the heroes that come to mean so much to the reader. Two characters whose support of each other makes them heroic is a modern concept, not a medieval one. Neither Aragorn’s journey through the Paths of the Dead nor his crowning as King of Gondor brings a lump to readers’ throats; that lump arises when Frodo and Sam in the darkness of Shelob’s lair in Cirith Ungol wonder together whether anyone will remember their deeds or when they face their fate side by side amid the rivers of fire rising to destroy Mount Doom at the end of their quest. Gollum, with his divided psyche, is clearly a monster but one portrayed in terms of much more modern nuances than medieval monsters were, such as Grendel. Also, as Sharin Schroeder discusses in her essay in our Approaches volume, Tolkien’s work has much that is directly modern to say about the ramifications of warfare for future generations, the position of the artist, the impact of industrialization on the natural world, and the dangers of cultural isolation. JH: In the classroom, how do you approach issues of race and gender in Tolkien’s work? LD: Discussions of race, class, and gender in Tolkien’s works have become increasingly important to address openly and directly in the classroom. There is no doubt that as a middle-class English male, Tolkien was a product of his time and culture. He was no protofeminist or activist for ethnic rights and cultures. Yet, in my classes on him, we examine the texts closely for what they tell us about his struggles in thinking about issues of race and class. We discuss the racial antipathy and then reconciliation of the dwarves and elves through the friendship forged by Gimli and Legolas. We remark that Tolkien’s Easterners and “cruel Haradrim” incorporate physical features uncomfortably similar to Asian or Middle Eastern peoples in our own world, but we also hear Tolkien speaking through Sam’s musing about whether the internal thoughts and yearnings of the dead Easterner he encounters are actually so different from his own. As Dimitra Fimi proposes in her essay in our Approaches volume, whenever possible, I introduce the complexity of perspectives on race in Tolkien’s works by highlighting the changes in his thinking about such issues over the course of his life as well as by noting historical contexts related to ideas about race and culture that informed his views. My students almost always believe that Tolkien has little interest in female characters, until I give them exercises in which they realize that Éowyn is presented as one of the text’s greatest heroes and Galadriel’s power and authority to command surpasses that of her husband, Celeborn. In addition, I use a strategy I learned from Shelley Rees’s essay in our Approaches volume that asks students to identify masculine and feminine traits in the texts and to decide which are valued more highly. My students inevitably come to the conclusion that in The Lord of the Rings feminine behaviors or traits such as cooperation and complementarity are valued much more than such masculine attributes as physical prowess and solitary action. And they begin to realize that characters such as Aragorn, Frodo, and Gimli reflect such traits as obviously as any of Tolkien’s female characters. JH: The Lord of the Rings only hints at the vast mythology of The Silmarillion: the feelings basic to religion—awe, need, love, sacrifice, devotion—are found in it without our ever being fixed in a religious system. How do you connect The Lord of the Rings with the larger myth-world for students? LD: Currently, I am teaching an honors course titled “Mythmaking and Tolkien.” In it, I foreground the mythopoeic context so crucial to Tolkien’s world building. In previous Tolkien courses, I always touched on a few of the mythological components of the larger legendarium but rarely had enough time to delve into such materials. I assigned my students a few selected portions of The Silmarillion, and we would discuss the roles that abstract concepts such as chance and pity, fate and love, played in the schema of Middle-earth’s evolution and development from a mythic prehistory to a historical period of discrete, well-defined events, people, and places. But in this new honors course, we investigate the components of Tolkien’s mythmaking by focusing first on The Silmarillion and then ending the semester with The Lord of the Rings. To highlight the emotional (even perhaps reverential?) potency of the mythopoeia that was so key to his vision of Middle-earth and how it both mirrors and forecasts our own world, my students are not only reading Tolkien’s literary texts but also studying his paintings and drawings. We compare Tolkien’s mythmaking with other world mythologies. We have also discussed more briefly music associated with Tolkien’s world and the linguistic backgrounds for some of his languages. By exploring this multitude of materials that Tolkien incorporates into his mythopoeia, my intention is that by the end of our course students will have a stronger grasp of the interconnectedness of his mythic vision, which is projected both within its own fictional boundaries and beyond them through his world’s relation to our own world’s history. JH: This has been fascinating. Thank you for taking the time to do this interview. I look forward to the reaction to the book and to seeing your journal on MLA Commons, Waymeet for Tolkien Teachers, develop. Leslie A. Donovan is a professor in the Honors College of the University of New Mexico. In addition to many articles on medieval literature, Tolkien, and pedagogy, she has published Perilous and Fair: Women and the Works of J. R. R. Tolkien, edited with Janet Brennan Croft (Mythopoeic Press, 2015) and Women Saints’ Lives in Old English Prose (Boydell and Brewer, 1999). She is currently working on The Old English Lives of Eugenia and Eufrosina: A Critical Edition of Two Female Transvestite Saints in Their Anglo-Saxon Contexts.